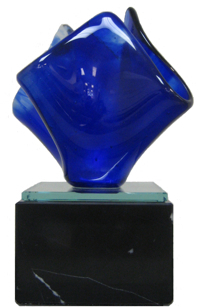 This beautiful blown glass design is brought you to by PlayAll Awards from R.S. Owens, the makers of the Oscars! PlayAll Awards can craft custom awards to fit any budget. We are the creator of the Aboriginal People's Choice Award, a nationally televised event featuring artists from all over North America. We are also the makers of the Blue Bomber 'Player of the Game Award'. Ever wonder how awards and trophies are created? Our designers are experts at crafting new & unique awards. We are always searching for new ideas. Most recently Sherry Tuck, co-owner of PlayAll Awards and Darlene Chandler, a 15-year employee & awards designer attended the Awards & Recognition Association’s International awards market in Las Vegas - the largest awards trade show in the world. There they made connections with the best of the best in awards, including R.S. Owens the maker of the Oscars, The Emmy’s & Nascar’s Nextel Cup. As a result of the connection with R.S. Owens, we were able to present to you this unique and beautiful award as outlined in the picture – “At an affordable price”. If you wish to have a very special award for your celebrated event – even one from the makers of the Oscars!! - visit our showroom at 980 St. Mary’s Road or online at www.playallawards.com. Or call (204) 233-8523. At PLAYALL AWARDS – Our customers are always winners ! e-newsletter marketing provided by OfficeSmarts.